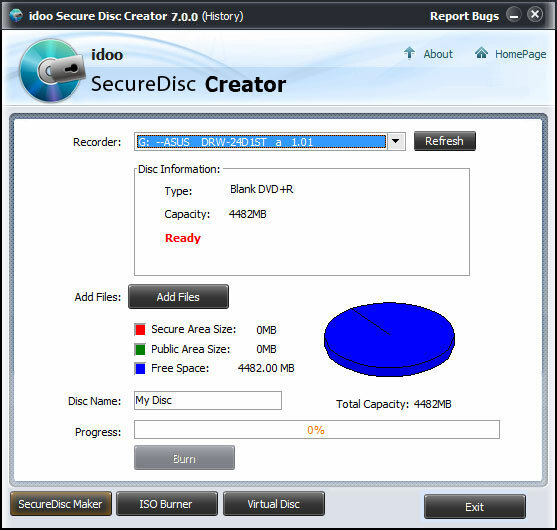 idoo Secure Disc Creator is a free DVD or CD copy protection software for creating encrypted data files, virtual discs and burning encrypted CD/DVD. It can create a safe area and public area in one disc concurrently. Using Military Standard of 256-bit AES on-the-fly encryption algorithm. The idoo CD DVD Encryption package is designed to be used to backup important data. 1. 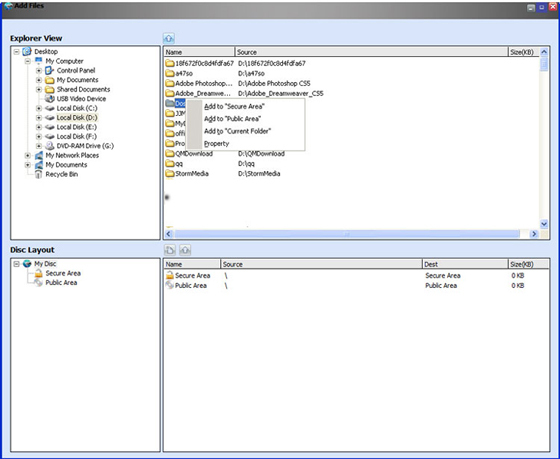 Select the disc type you want to create from the right side of the "Recorder" device list. 2. Insert a blank or erasable disc into your recorder. 3. Click "Add files" button. 4. Add files into a safe area or public area, and click "Burn" button to start burning your disc. Send a disk through the mail to a third party, tell him/her your password, he/she can open your encrypted CD/DVD disc easily. In order to avoid any unnecessary loss, please do remember the password, there would be no one could figure it out!